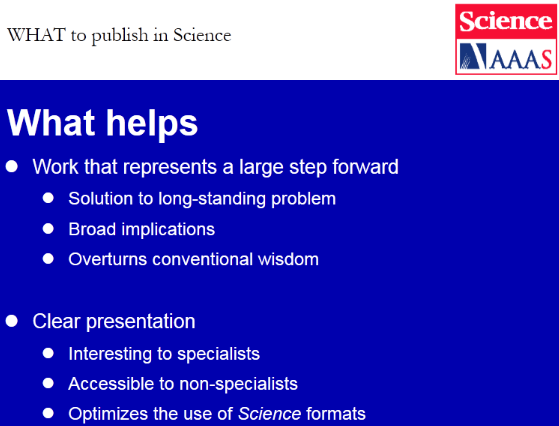 Hines noted that Science publishes research articles that “shine with quality”, stand out from the pack (i.e. are not similar to already published reports), and can be recognized as “outliers, closers, and leaders”. As she explained, an outlier is a research paper on a fresh, unexpected topic; a closer is one that presents unequivocal evidence to resolve a scientific debate; and a leader is one that moves science forward by “defining new questions”. 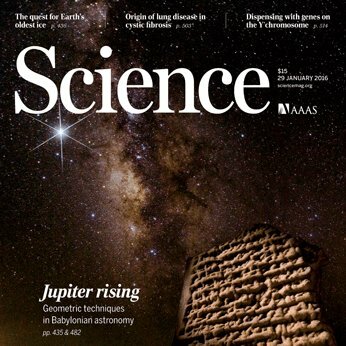 Manuscripts that are immediately rejected by Science are not of broad interest, report a minor scientific advance, draw conclusions not sufficiently supported by the evidence, are lacking in mechanistic insight, or report “permutations of known phenomena” (i.e. research repeated in a new biological model system); these latter papers are more suitable to publication by specialty journals. Hines’ suggestion for new authors is to focus on the “logic of thought flow”, as this aspect of good writing has a strong influence on the editorial decision.